Vrijdag 10 juli 2015 is het bestuur van de Stichting Schoolproject-Uganda uitgenodigd door Catz International (CI) om te komen overleggen over een mogelijke donatie. 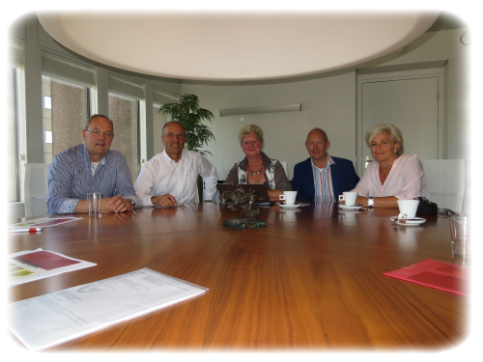 Catz International heeft een eigen Charity Foundation (CCF) welke diverse projecten steunt in landen waar Catz International actief is. In Uganda is Catz International recent gestart met het verbouwen van pepers en ons project sluit mooi aan bij dit initiatief. Catz International heeft tijdens dit overleg een donatie van â‚¬ 10.000,- toegezegd waarmee de Stichting uitermate verheugd is. Met deze donatie is de Stichting in staat de bouw van 4 klaslokalen op korte termijn te starten. Vrijdag 11 september 2015 was het moment daar dat de officiÃ«le overhandiging van de cheque plaats vond. Henk Moerman van Catz Charity Foundation overhandigde deze aan het bestuur van de Stichting. De Stichting Schoolproject-Uganda bedankt Catz International voor deze gulle gift. Catz International has been trading in raw materials for the food industry since 1856 when the Catz brothers opened their first shop in Groningen, The Netherlands. In subsequent decades their activities expanded rapidly. A branch was opened in New York in 1916 and the following year the Dutch headquarters moved to Rotterdam, a major commercial centre. Spice trade with the Dutch East Indies (now Indonesia) was always a major focus for the company. So in 1918 the Catz Java Trading Company was established in Batavia with branches in Padang, Macassar and Teluk Betung. Trade in canned goods and dried fruits also continued to grow. This led to the opening of an office in San Francisco in 1927. Shortly after World War II yet another office was opened in Singapore, a major trading hub for Indonesian produce. The mid-sixties saw a strategic decision to centralise all trading, logistic and administrative activities in Rotterdam. In 1982 Catz International joined forces with the Acomo group and has been its most profitable subsidiary for many years.